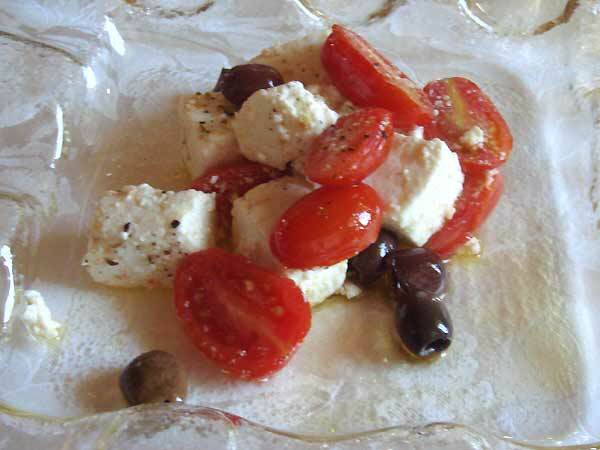 Salad of warm ricotta cheese with cherry tomatoes and olives. Cortina is to northern Italy what Cannes is to southern France and what Banff is to western Canada. It is a chic destination with trendy shops and lots of beautiful people to go along with the gorgeous scenery. After soaking up the scene for a little bit we headed out of town for a late lunch at a rustic mountain establishment with some very fine dining (kind of Nordic chalet meets chic restaurant). It’s a stop for cyclists, motorbike tourists and locals alike. It was a fine meal (emphasis her on the iiiiiii’s), the kind that could convince even the biggest mushroom phobic to love porcini mushrooms, or any other wild mushroom for that matter. And it puts those grocery store white mushrooms to shame. It could also make a dessert-lover out of the greatest skeptic. To be a completist, I’ll describe my menu for the meal. I started with a salad of warm ricotta cheese with cherry tomatoes and olives. Next papardelle (a pasta about twice as wide as fettuccine) with porcini mushroom and olive oil, and finally a molten chocolate cake served with a goose berry and a strawberry mousse on a walnut crisp that nearly made me fall off my bench. In keeping with the tradition of this trip, my mouth was watering so much that I forgot to snap a photo before digging in. If it keeps up I’m going to have to start snapping pictures of the aftermath of empty plates and wine glasses that comes with each meal. After an hour’s hike up an “easy” path in the Dolomite Mountains with a friend we settled in at “Rifugio Laresei,” a refuge at the top of the mountain for some local fare, along with an espresso and some people watching. I had some “Gnocchi Con Ricotta Salata” and a green salad. Gnocchi are potato dumplings, which in this case were tiny little balls tossed in an herbed butter and topped with lots of salty cheese. It was the perfect conclusion to an an active morning. When else would I have an actual excuse for ordering something that rich? Near the end of the meal a group of campers aged around 12 to 14 took over the restaurant and provided the afternoon’s entertainment for us. It was quite a site to watch servers dodging a massive crowd of tweens ordering hot drinks and desserts and buying out all the chocolate and candy at the bar. Even Italian kids, it seems, will choose the convenience of a pre-packaged sweet when given the chance. Later the same day, after a much shorter walk through a spectacular canyon, we settled in for another sampling of the best pizza Italy has to offer. 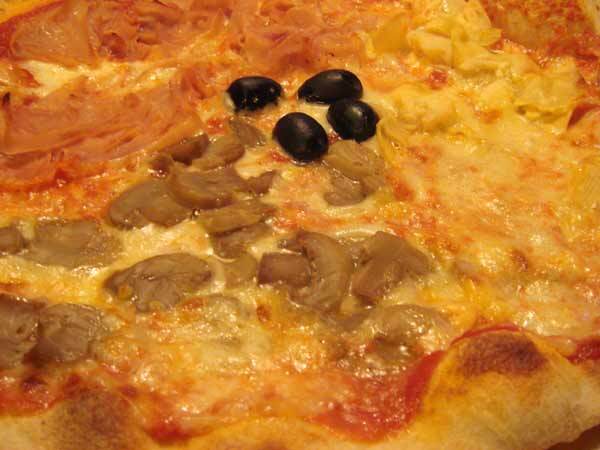 I ordered “Quattro Stagioni” or “Four Seasons,” which comes with ¼ artichokes, ¼ mushrooms, ¼ prosciutto cotto (cooked ham), and olives in the middle. My friend made a fascinating observation at that point, saying she could never figure out which topping stood for which season. Brilliant. We finished the day at one of the few places I’ve seen in Italy that will make you a dessert that combines ice cream and toppings…all I had to do was order the thing with the most chocolate. Yum! 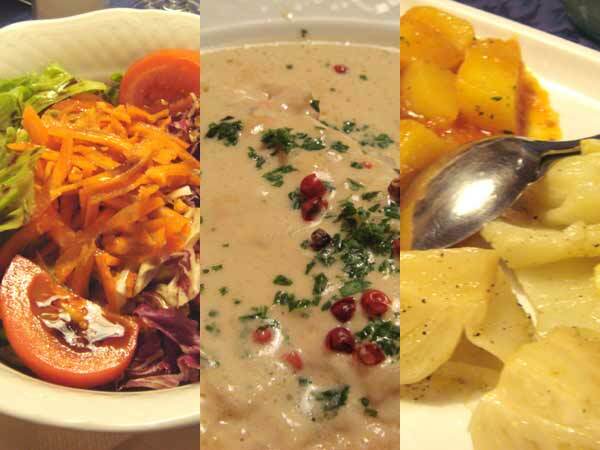 Green salad, trout with salmon sauce and potatoes and fennel. After hours and hours of snacks from roadside service centers we were relieved to arrive at a friend’s place in northern Italy’s Dolomite mountains and be whisked off to a local ski hotel for a proper dinner. Never has a tossed salad tasted so fresh. That was followed by trout in a salmon sauce with red peppercorns, yum. In Italy sides or “contorni” are generally served separately, or what we would call “family style.” This evening it was potatoes in tomato and braised fennel. I love fennel anyway (as you may remember from one of my earlier posts) and on this night it was spectacular, with an almost candied flavour. I also tasted a regional specialty, stewed meat served with grilled polenta, a corn-based bread. The meal was topped with some refreshing house white wine, fruit and espresso. I know they say being on the road helps you appreciated the tastes of home, but I think it also makes you appreciate a well-balanced, well-cooked meal with friends. Second home-cooked meal of our trip, and my cousin pulled out all the stops. There was an antipasto (appetizer) of good cured meat, even better cheese with honey and figs, glorious figs. Our first course was “Orecchiete al’ammatriciana,” or ear shaped pasta in a light cherry tomato sauce with finely diced pancetta and rucola (aka arugula and rocket). The question going through my head was “Is this what heaven is like?” Next we had beef stew with carrots, rucola salad with shaved parmesan and baked bell peppers stuffed with cheese and herbs, which was totally wow. Fresh fruit, homemade Tiramisu and fresh but store-bought pastries (our contribution) rounded out the meal along with a good, hot espresso. The meal also included lots of great conversation in two languages, covering topics including; politics, weather, cars big and small, populations, weddings, nepotism and the economy. Along with some homemade wine and lots of laughter, this is what a night with family is all about. It seemed a little out of place. We found “Ristorante Sushi Lucky Wok,” which bills itself as a Chinese-Japanese restaurant, in the middle of a small to mid-size Italian town surrounded by cafes and pizzerias. Truly the only ethnic restaurant I’ve seen so far on this trip. We ordered sushi, and the Asian-Italian waiter immediately asked if we were Italian. I guess they don’t get much demand for raw fish rolls. We threw them for another loop when we asked for chopsticks, and we learned the Italian word for them is “bacchette.” I have to say the sushi was fine, which surprised me. 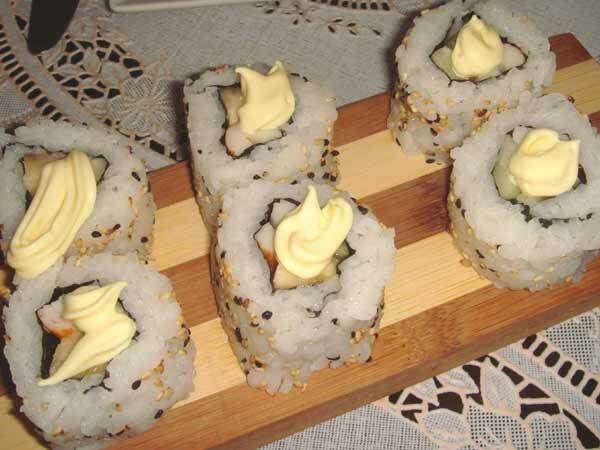 There were some interesting variations, including a California roll that included banana instead of avocado, topped with mayonnaise. The rice was also not quite sushi rice, my theory being that long grain rice may be the only one available. All in all it was an interesting experience to order Japanese food in Italian and see a restaurant run by a family switching between fluent Italian and, most likely, Japanese. Wow, Amanda! I am loving reading all about this wonderful food! It sounds like you guys had a great time and were definitely well-fed! What a treat to read about your travels and all the delicious meals you had. I tried to make the cherry tomato, warm cheese, and olive salad (with the addition of a sliced up green onion). It tasted great, but didn’t look as good as your picture because I used feta cheese, some of which melted when I tried to “warm” it. Next I’ll be trying your “quick tomato sauce with sausages”. What is usually in your quick tomato sauce and also in the fresh tomato sauce you had with your relatives? Your salad sounds delicious! For the tomato sauce I usually saute an onion until it’s golden, add a jar of whole or diced tomato (fresh tomatoes are even better if you have the time to blanch them and remove the skins and seeds), along with some basil, oregano, salt and pepper. You can put the sausage into the sauce raw and let it simmer for at least 45 minutes, but I prefer to fry it in a pan with olive oil until it has browned then let it finish cooking in the sauce (put all the drippings in too, they’re very tasty, if fatty). Hey so great to finally have a minute to read about your culinary adventures in Italy – reminds me of Michael Smith in all those exotic places. Brings me back to Italy… especially the pizza, its just not the same anywhere else in the WHOLE world. Have you considered applying to be a newpaper writer? Very nice grammar! Your article Flavours of Italy – Week One, Part Two | Tasty Tangents was in my Google news feed. Congrats on the article.